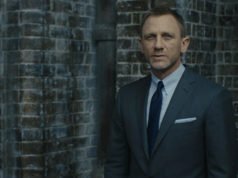 Though shawl collar is not the style of dinner jacket that James Bond has worn the most often, it might be the style that he is most associated with. Sean Connery was introduced as James Bond wearing a shawl collar dinner suit in Dr. No, and a famous photo shoot for From Russia with Love featuring him wearing another shawl collar dinner jacket posing with a Walther LP53 airgun solidified the shawl collar as the classic Bond look. For Skyfall, Daniel Craig’s midnight blue dinner suit that was enhanced to a bright blue for the film’s posters brought renewed attention to the shawl collar dinner suit. Hardy Amies defined the shawl collar in his 1964 book ABC of Men’s Fashion as a “roll collar”, which he then defined as “a collar without lapels, unbroken by any kind of notch, so that it rolls smoothly down to the jacket front.” The only break in a shawl collar is a seam at the back of the neck, which helps it sit comfortably against the neck and allows for alterations. The shawl collar is a decorative style of collar that made its way to early dinner jackets by way of the smoking jacket. And before the smoking jacket, the shawl collar was a style found on dressing gowns, where it is still commonly used. Today another popular use for the shawl collar is on cardigans. It is occasionally found on overcoats, but more often on women’s than on men’s. James Bond creator Ian Fleming wore a pea coat with a shawl collar. 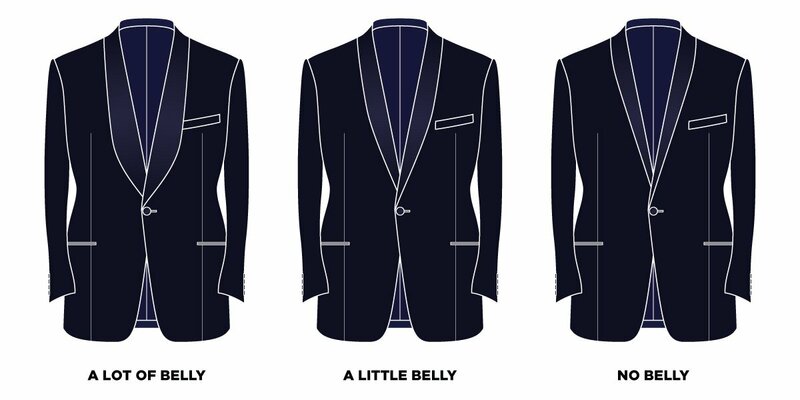 With seven appearances of this style of dinner jacket throughout the series, all on either midnight blue or black dinner single-breasted suits, the shawl collar has seen a number of variations. As with any lapel style, width is the first aspect of the shawl collar’s design that people notice. 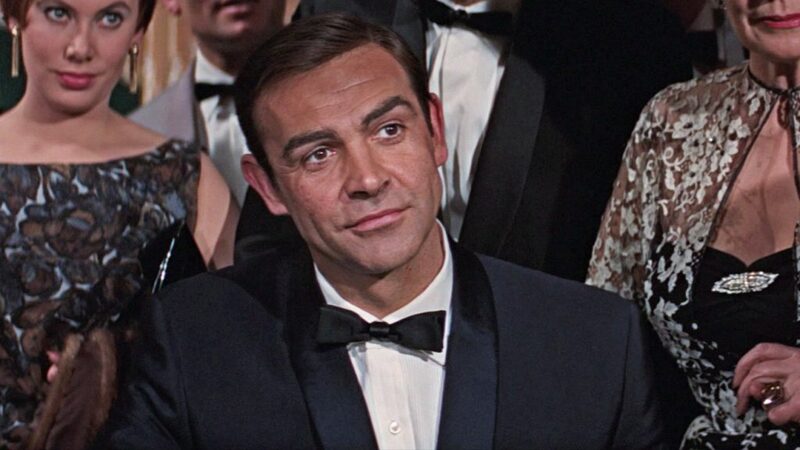 Bond’s narrowest shawl collars feature on Sean Connery’s Anthony Sinclair dinner jackets in From Russia with Love and Thunderball and are around two inches wide, following 1960s trends for narrow lapels. There’s a certain coolness to a narrow shawl collar. Without the break between the collar and lapel, shawl collars visually appear wider than ordinary lapels. While Connery’s lapels in those films are around 2 3/4 inches wide, the narrower shawl collar appears to be similar in width. 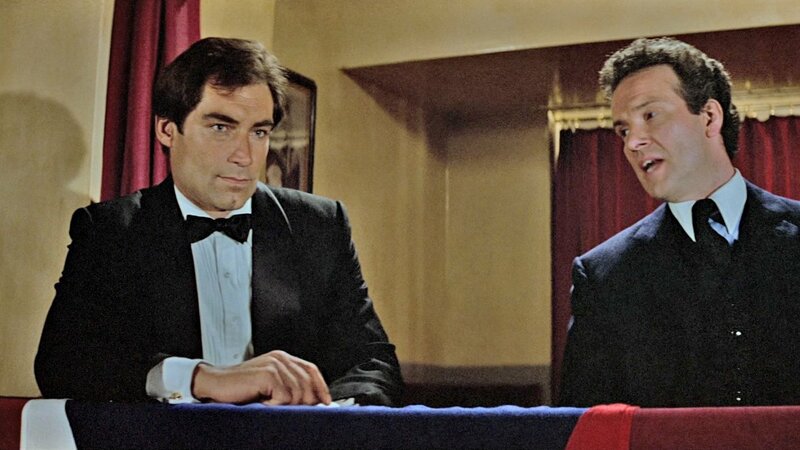 The shawl collars on Timothy Dalton’s first dinner jacket in The Living Daylights and on Daniel Craig’s Tom Ford dinner jacket in Quantum of Solace feature the widest shawl collars of the Bond series. These examples are around 3 inches wide, but like Connery’s shawl collars they look even wider when compared to ordinary lapels. Wider shawl collars have a more traditional look than narrower examples, and if you asked Tom Ford he might say they lend a more luxurious appearance to a dinner jacket. Belly is the outer curve of the shawl collar through the chest, and all good shawl collar designs have at least a little belly. Shawl collars traditionally have more belly than other lapel designs since curviness is in the nature of the shawl collar. Without any belly—a straight edge from the upper chest to the buttonhole—a shawl collar has an unbalanced and anorexic appearance. The illustrations above demonstrate different amounts of belly, with the example on the left having more belly than any of James Bond’s dinner jackets have and the example in the middle being a minimum amount of belly. The middle example is similar to the shape of the shawl collar on Sean Connery’s dinner jacket in Thunderball. All of Bond’s examples fall between the first two with varying shapes having varying degrees of fullness in different areas. The example on the right has no belly and looks unbalanced. 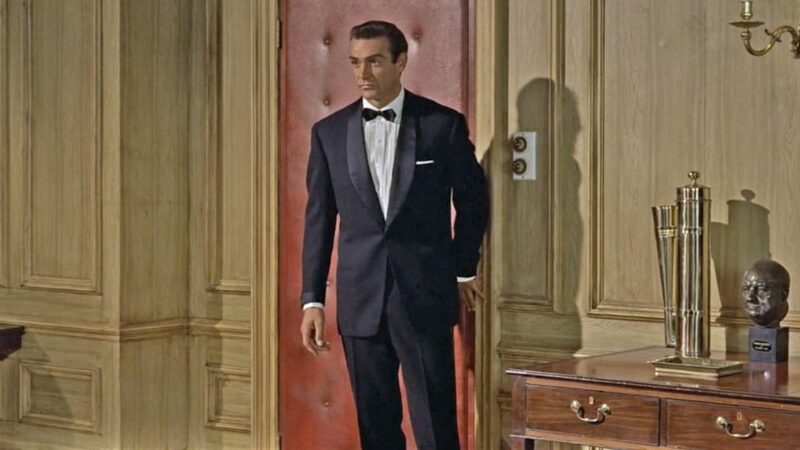 Sean Connery’s dinner jacket in Dr. No is the most bellied of any of Bond’s dinner jackets in the series, where the fullness of the collar is pronounced in the middle of the chest. A lower placement of the collar’s widest area gives an overall wider look to the collar. A shawl collar with a buttonhole in Quantum of Solace. 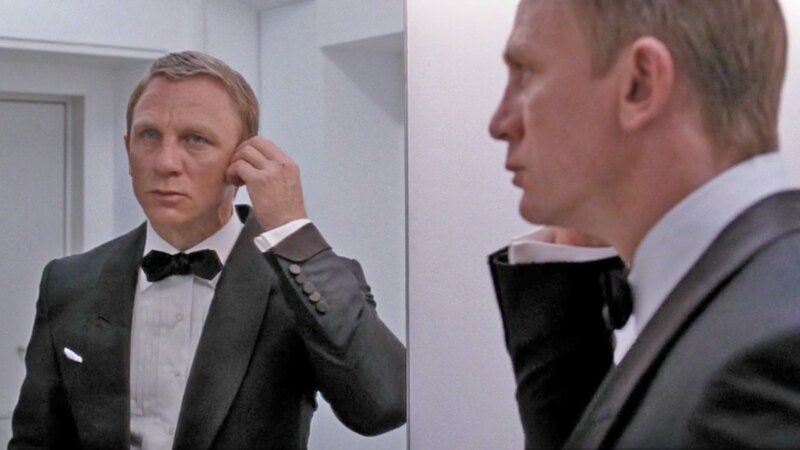 Note that Bond is looking into a mirror, so the buttonhole and breast pocket are actually positioned on the proper side. Shawl collars traditionally do not have a buttonhole like peaked and notched lapels have because a shawl collar is not derived from a type of collar that fastens. A buttonhole disrupts the continuous line of the shawl collar. Some designers, however, like a buttonhole in their shawl collar for the option to wear a boutonnière through the buttonhole like people can do with peaked and notched lapels. For sophisticated dressers, pinning a boutonnière to a collar or lapel is not an option. Tom Ford is one of the designers who often puts a buttonhole in his shawl collar, and the shawl collar dinner jacket that he made for Daniel Craig to wear in Quantum of Solace has a buttonhole through the lapel. The buttonhole is placed on the left side like any normal buttonhole in a single-breasted lapel would be placed. It is positioned as if the lapels were peaked, with the buttonhole slanting slightly upwards. The buttonhole is placed a bit lower than it would be on peaked lapels, giving more prominence to a flower that could be placed in the buttonhole. I found the infographic image very helpful. 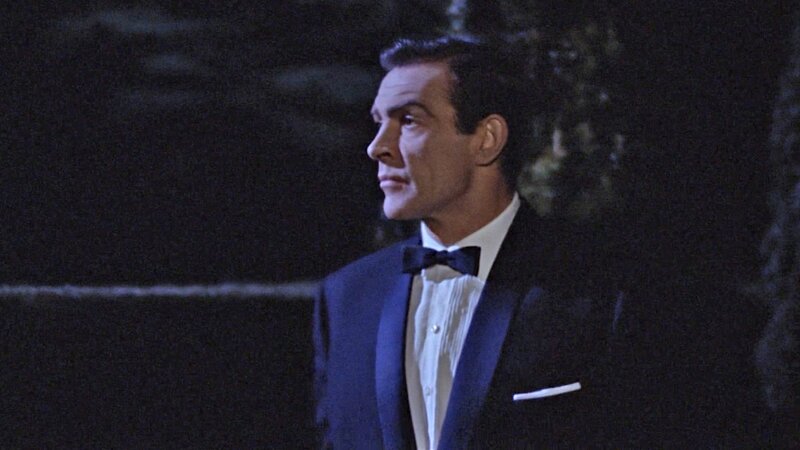 I usually don’t like shawl collars when I see them even though I think the black tie in Dr. No and Thunderball are the best ever, but I haven’t been conscious of why. I think now it is probably the effect of different widths and belly that make the difference. I bought a double breasted shawl collar waistcoat from a cheap Asia based MTM store once and it was terrible. I asked for some belly on it and their interpretation of that was to create a squared lapel, where it comes out at a 90° angle from the top button and curved shaprly up and straight into the collar. Needless to say I complained a lot and their second attempt was far better. I kept the old one around out of amusement and as a lesson to myself not to settle on cheaper options. Timothy, you may reconsider. Unless the version is really poorly done, the lapel you are talking about is similar to several versions worn in the 30s to 50s, often with white tie. I find it quite elegant, although perhaps more appropriate to white tie than black tie. 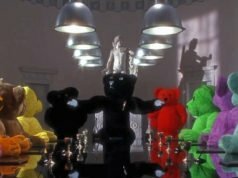 You can see several examples of it at the website blacktieguide.com. As well in numerous Hollywood classics. I would like to see a picture of it actually ! No believe me, this one’s terrible! 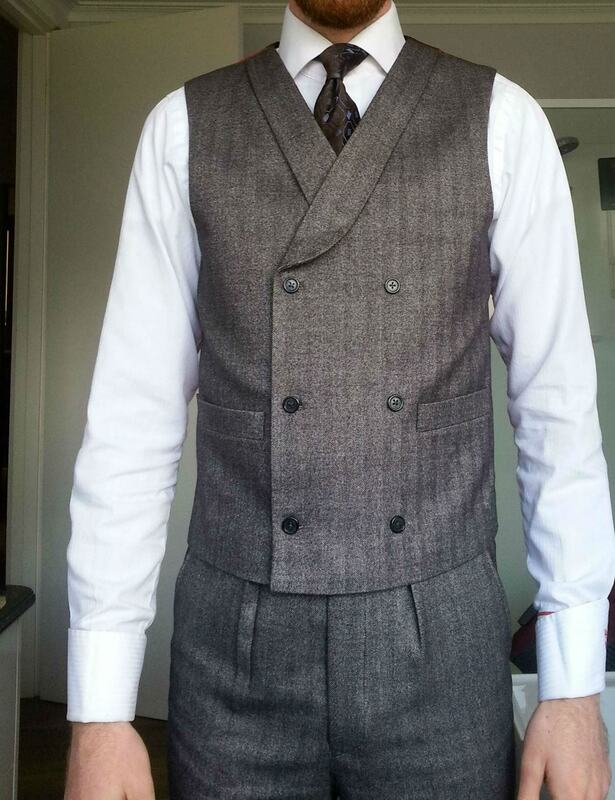 I have a waistcoat as part of a vintage dinner suit with those lapels and it’s beatiful. This. . . Isn’t. The problem with this waistcoat isn’t so much the lapels as it is the button stance and length. The bottom buttons should be a little bit higher, and the hem should be closer to the bottom buttons. The top buttons should be considerably lower so that the all of the buttons have a much closer vertical spacing. The space between two rows of buttons on your waistcoat is how far apart the top buttons should be from the bottom! Oh… I see the problem. The lapels should just start at the middle row of buttons and the top row should just be placed between the middle and bottom ones. But it’s indeed atrocious and elongates the torso way too much. Great article ! The shawl lapel I prefer is clearly Dr No’s one. It has a beautiful belly, like lots of late 1950s dinner jackets worn onscreen. I think the width of the lapel will always be a great subject of debate, too. Of course being it tastefully done a wide and a narrow version can always work. But I think the physique (and thus the size of the jacket is important). Connery looked great in jackets with slim lapels but perhaps because he was pretty huge. A slim lapel on a person wearing a 38R will look quite different. And slimmer Bonds like Brosnan and Dalton (who looks great here in his dinner jacket I might add) will probably look better with a medium/wide shawl collar. I would like to hear other people’s opinions about this. Of course a person wearing a say 44R and having an athletic, v-shape figure could wear almost any kind of lapel width, while an overweight person wearing the same size should probably stay away from extreme lapel width. I think it’s a rather strange contradiction that Connery looked good in narrow lapels, actually. I think someone with a smaller chest would actually look better in narrow lapels- not wide- as they wouldn’t look nearly so malproportioned. See some of Roger Moore’s suits from ‘The Saint’ for that strange look. So why does Sean Connery look so good in them? It seems to go against all the sartorial logic that I’ve learned. That’s a great point Timothy. My preference will almost always lean towards slimmer lapels and I love the proportions of the suits during Connery’s earlier tenure. My favourite of the entire series is probably the light gray sharkskin in Thunderball when he goes to the Junkanoo with Fiona Volpe. Recently I saw a few episodes of series one of The Saint and despite my stated preference the skinny lapels on many of Moore’s jackets look lost on his broad chest. They were likely not that much slimmer than Connery’s lapels and I believe both men were of a similar size in these examples. I was inspecting a vintage DJ some months ago with a shawl collar that I couldn’t determine whether or not it had any belly. A result of its slim lapels, I presume. I think both can look great but I do have soft spot for wide lapels of any size, shape or form. It has belly and looks good! I agree with Matt it looks good. I like this slimmer shape to the lapel as it gently rolls up from the buttoning point. I don’t like the shape alluded to earlier where the lapel edge steps out almost horizontally from the buttoning point before doing a right angle up towards the collar. I seem to remember Chris Rock sporting an ecru jacket when he last hosted the oscars with this shape lapel and it looked poor aside from the rest of his (IIRC) canonical black tie rig. Chris Rock’s example was poorly executed, but I’m not against the idea behind what his jacket was trying to achieve. Another great article Matt. I always thought the balance for shawls needed to be just right. For my own personal taste, the Dr. No shawl is just right. Completely agree. I have no idea why some designers think this looks good.